I’ve got a friend who, despite being one of the most lethargic people I know, has got calves the size of tree trunks. To the innocent bystander he’s a physical anomaly. This is a man who has spent the best part of his life on a diet of cheese toasties and Walkers crisps, who would struggle to ride a bike without stabilisers and thinks squats are what you do when you can’t get to the toilet, and yet he can make flares look like skinny jeans. His rationale; they’re dog walker’s calves. And he’s not alone in his reasoning. New research has revealed dog owners in the UK are fitter and healthier than people without dogs, exercising at least three times more a week than the rest of the nation and covering an average distance of 1,092 miles a year on foot, compared to the 364 miles walked by those who don’t have one. 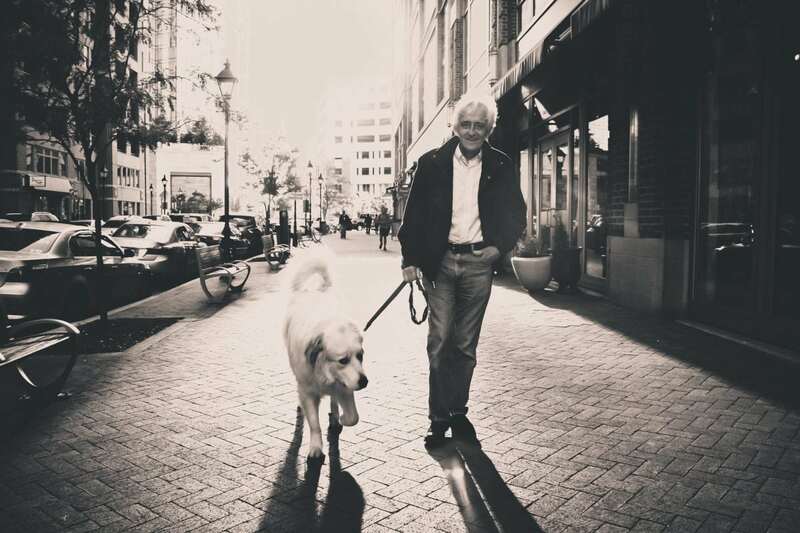 The research found that not only did owning a dog affect the amount of walking a person does, but also that dog walkers were more active overall. As well as walking around the neighbourhood daily, it emerged dog owners are more likely to walk than drive anywhere, more likely to take the stairs than the lift, and are generally always on their feet. Now I’m not sure whether he would eschew the lift for the stairs, but he does seem to subconsciously walk and stand more than other people, and he has on more than one occasion raised the therapeutic benefits of getting out with the dog. The Butcher’s Pet Care study found one in three dog owners said walking their dogs allowed them to de-stress after work, and a quarter felt it helped them to escape their busy schedules. And as much as I can never get on board with the notion of owning a dog – my brother recently got one and now uses #terriersofinstagram and #dudeswithdogs on his Instagram, I suggested trying c*nts with canines – this is one aspect I can get come to terms with. The truth is that the secret to good physical and mental health isn’t spending hours in the gym and sticking your head in mindfulness colouring books day in day out, it’s simply about getting out and stretching your legs. So forget fretting about missing leg day, get a house in Yorkshire and buy a terrier. You’ll be buff in time for short season! The average dog owner spends 58 minutes a day walking with the dog – which equates to approximately 3 miles a day and 21 miles over the course of one week. This means dog lovers are walking an incredible 351 hours a year, covering a distance of 1,092 miles. In addition to miles walked, owners are chasing their dog around the garden for 16 minutes every day, that’s 97 hours every year. The average dog owner also goes for a jog with their dog between two and three times a week for good measure. Researchers discovered the bigger the breed of the dog, the fitter dog owners were too, with Golden Retrievers, Bulldogs and Boxers needing the most number of walks per day. A fifth of dog owners like the fact they get to meet and bump into other people when out and about, while a third make the most of the only fresh air they’ll get during the day. A quarter of people polled like dog walking as they can escape a hectic schedule and 14 per cent say it is good to get technology-free time.